Saturday League club West Pier are celebrating after finishing 2016 with an outstanding unbeaten record. 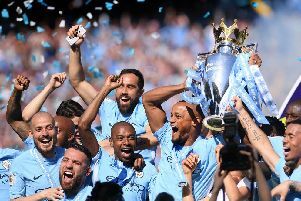 Their superb record extends back to October 2015 and includes 39 wins and two draws from 41 games, which saw them scoop the quadruple last season. A 3-1 defeat in the League Cup against eventual winners Newlands on Saturday October 31 proved to be the catalyst for an uprecedented run of results that saw them lift the Division One title, the North Riding County FA Saturday Challenge Cup, and Harbour and District Cup trophies. Delighted boss Andy Spivey was quick to sing the praises of his squad. He said: “Our unbeaten run started in November 2015. Obviously we’re delighted with this in our 40th anniversary year. “Credit to everyone involved, to every player who pulled a shirt on throughout this period and for them to maintain a remarkable hunger and keep the run going. Spivey’s side scored 222 goals across their remarkable run, conceding only 41, including 15 clean-sheets. The boss singled out their NRCFA Saturday Challenge Cup final win against Stokesley as the stand-out win. “The stand-out win would have to be beating Stokesley so convincingly on their own patch to win the North Riding Cup,” added Spivey. Pier are currently top of the Division One table and have extended their title-winning form into this season. They have racked up 25 wins on the bounce and are sitting pretty at the top of the table with nine wins from nine games, six points clear of second-placed Hunmanby United with two games in hand.